IEC 61010-2-081:2019 is available as IEC 61010-2-081:2019 RLV which contains the International Standard and its Redline version, showing all changes of the technical content compared to the previous edition.IEC 61010-2-081:2019 applies to automatic and semi-automatic laboratory equipment for analysis and other purposes. Automatic and semi-automatic laboratory equipment consists of instruments or systems for measuring or modifying one or more characteristics or parameters of samples, performing the complete process or parts of the process without manual intervention. Equipment forming part of such a system is within the scope of this document. This third edition cancels and replaces the second edition published in 2015. This edition constitutes a technical revision. 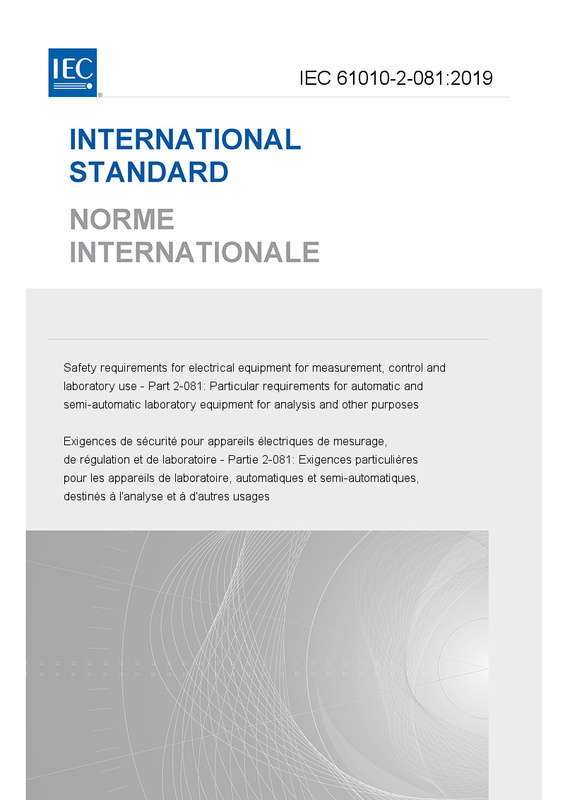 This edition includes the following significant technical changes with respect to the previous edition: - adaptation of changes introduced by Amendment 1 of IEC 61010-1:2010; - added tolerance for stability of AC voltage test equipment to Clause 6. It has the status of a group safety publication in accordance with IEC Guide 104.